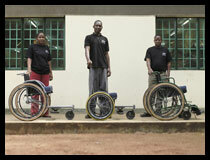 In 2001 in a small workshop in Arusha two men started making wheelchairs. Their efforts were noticed by several development organisations who helped them make the project into a proper business. Now there are four technicians working in the MobilityCare workshop. They are all trained in wheelchair technology. 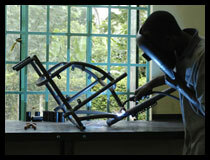 To involve local industry, manufacturing of many parts is contracted out to local companies. As well as making wheelchairs MobilityCare offers training and help for technicians wanting to start wheelchair production workshops in different regions. By means of regular visits, the international disability charity Motivation provides valuable support in training and technical advice. Gradually a regional service network is being formed. MobilityCare has an advisory board for assistance and advice on general management issues.